Telomeres and telomere length are one of the keys to understanding longevity. Genetic sequencing has revealed the telomere and telomerase enzyme as the main factor in DNA deterioration and aging. Thanks to gene sequencing we now know a lot about our molecular machinery and how DNA damage can lead to chronic illness and eventual death! In simple terms, a telomere is a kind of “cap” made of DNA which protects the ends of the chromosomes from damage when cells divide. Over time as a person gets older the cells have trouble copying the DNA information accurately and errors build up. 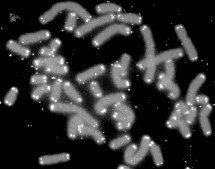 Telomere lengths keep getting shorter with each cell division until the cell cannot divide any more, thus causing something called senescence which leads to the death of the cell. The p53 gene is activated when there is DNA damage and prevents the cell from dividing with errors in it's DNA information. Since telomere length determines your cells ability to divide, scientists think this telomere shortening is a natural defense mechanism to prevent abnormal cell growth which would lead to cancer! Telomerase is an enzyme that essentially maintains telomere length which in turn allow our cells to continue to divide with accurate DNA information. Scientists think that this enzyme could be the key to extending lifespan, but this is based on animal research. Experts caution that telomerase might also have negative effects such as allowing cancer cells to survive and divide at a rapid rate. Using telomerase to maintain telomere length has gotten the attention of drug companies anxious to cash in on a potential antiaging “blockbuster” drug! However experts have found that telomere length also depends on your nutritional status, and is influenced by such things as insulin sensitivity and fatty acid balance. Once again this points to the importance of nutrition in slowing aging. The ability of your cells to divide and form new cells is vital to health, and losing this ability is what leads to chronic disease such as heart disease, diabetes, Alzheimer’s disease and cancer. Telomeres which protect chromosomes from damage must maintain their length to be effective in order for your cells to continue to divide. The preservation of telomere length could theoretically prevent chronic disease and slow, stop, or even reverse aging! The effects of toxins generating free radicals, and also the lack of nutritional support can cause deterioration of the telomere, which in turn causes your cells to slowly lose the ability to divide, leading to aging and eventual death. Lets look at the nutritional factors that can help maintain telomere length and slow down the aging process in YOUR body! New research suggests that omega 3 fatty acids can protect a telomere from shortening. Thus the omega 3 index correlates with the health of your telomeres by protecting the integrity of cell membranes, helping cells detoxify themselves, and produce ATP energy properly. A nutritional supplement which is alleged to preserve telomere length is called TA-65, and is made by New York-based T.A. Sciences. It is extracted from the Chinese herb astragalus which has been used for medicinal purposes for centuries. This product has not been proven to successfully cure or treat disease, so any claims that it can maintain telomere length are not supported by proper scientific studies. At some point in the near future I will be investigating TA-65 and will review this product. If the above list sounds like a typical common sense approach to antiaging and health in general, its because telomere length like many other markers of aging and health is positively affected by proper nutrition and exercise. There is no doubt that supporting the health of your telomeres will keep you younger longer, and just may enable you to cheat father time far longer than you might think!